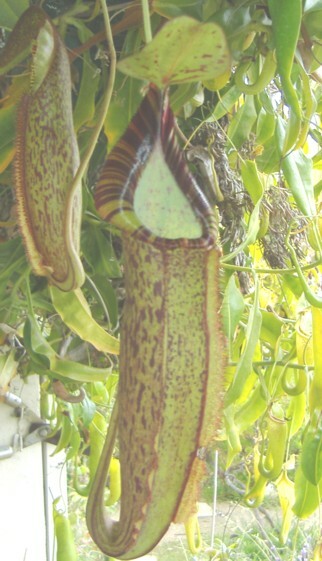 Nepenthes spathulata X spectabilis is a hybrid between two highlanders. The flared peristome comes from N. spathulata and the striped coloration from N. spectabilis. It has moved with me from terrariums, windowsills, solariums, to finally an outdoor hanging plant! It has been with me a long time and has done its best when it was put outdoors. The upper pitchers are more cylindrical and lighter colored than the lowers. I purchased it from California Carnivores over 10 years ago so I don't know its original origin. I'd like to say that it is an EP hybrid but I can't be certain of that. Regardless it pitchers regularly and has to be cut back every so often as vines reach well over 3 feet or so with multiple growth points.